The government has defended its efforts over the Sudan crisis, as UK aid planes prepare to leave for the country. 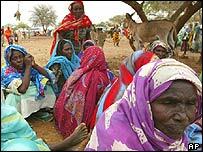 Oxfam planes will fly from Manston Airport in Kent on Friday, for the western region of Darfur. An estimated million people face famine and disease after Arab militias forced them from their homes. Some 10,000 are already thought to be dead. International Development Secretary Hilary Benn told BBC Radio 4's Today that Britain was doing all it could. "We have made it very clear to the government of Sudan that if they don't act to bring these attacks to an end, further consequences will indeed follow," he said. Britain had also backed an African Union ceasefire monitoring force which "could have a real effect" on tackling the crisis, he said. Mr Benn added that Britain is the largest cash donor to Darfur. An appeal by the Disasters Emergency Committee has reached £5m of its £10m target. The Sudanese Government denies accusations it is backing the Janjaweed militia, which has killed thousands of people in Darfur since February 2003. Sudan's Foreign Minister Mustafa Osman Ismail has warned the US and Britain not to meddle in its internal affairs. "We don't need any (UN) resolutions. Any resolutions from the Security Council will complicate things," said Mr Ismail, who likened US and British pressure as similar to that put on Iraq before the war. Prime Minister Tony Blair has described as "premature" reports the UK will send troops to Sudan, but added that there was a "moral responsibility" to deal with the situation "by any means we can". The "critical thing," in the short-term, was to try and make the current international strategy work, adding "we want the European Union to make a far bigger commitment on this," he said on Thursday. Foreign Secretary Jack Straw plans to visit the crisis-hit country next month. He is also pressing the EU to fund the Africa Union monitoring mission in the country, supervising a ceasefire between official government forces and rebel armies. The mission could include British personnel with military expertise, but Mr Straw stressed it would not be a fighting force. Mr Straw said: "The Sudan army is at best passive and at worst complicit in these attacks. "For the peacekeeping to be effective the Sudanese government has to stop the fighting. That's why we are sending very strong messages to the Sudanese." In the UN, Secretary-General Kofi Annan says he believes the Security Council is likely to back a draft resolution threatening Sudan with sanctions over Darfur. The US has circulated the resolution to Security Council members, which calls on Khartoum to crack down on atrocities in Darfur or face further action. In an interview with the BBC, Sudanese Interior Minister Abdulrahim Mohammed Hussein denied there had been massacres in Darfur. "Disarming the militias is a long process that required patience," he said.